For smooth, curved cuts and other fine work, it's tough to beat the results you can get with these essential saws. Coping saws and fret saws may have odd shapes, but they offer unique capabilities for cutting small workpieces. You don't always need to turn on a power tool like a jig saw or band saw to cut curved workpieces. If the pieces are small, a coping saw, or its cousin the fret saw, might be the better choice. Though it's often dismissed as just a rough carpentry tool, a coping saw can be extremely useful in the woodshop. And fine-cutting fret saws have been a mainstay of high-quality furniture making shops for a very long time. Chances are you already have a coping saw around the shop. For many woodworkers, this was the first saw we ever picked up. Its short blade and fine teeth make it safe enough for a young person to try their hand at woodworking. 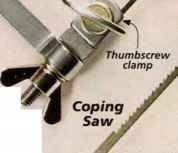 A coping saw is simply a C-shaped, steel frame with pivoting blade holders that capture pins on the ends of the blade. A few twists of the handle tighten the blade. This puts the blade under tension and allows it to cut fast, dght curves in just about any material. You can install the blade to cut either on the push or pull stroke, although for most work I find that a pull cut is easier to control. Of course, the saw gets its name from the coping cut used to fit molding together in place of a miter joint. That use has kept the saw in every finish carpenter's tool box for over a hundred years. 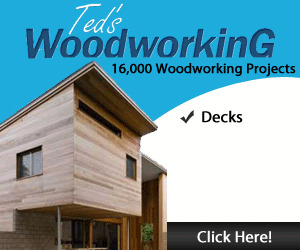 The availability of blades to cut wood, plastic, and even ceramic tile also make it an indispensable handyman's tool. 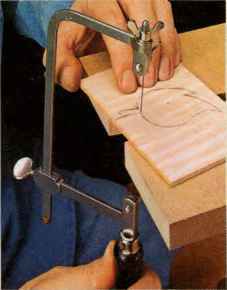 In the woodshop, a coping saw also excels at cutting curved parts for furniture and is especially useful for making interior cuts. All you need to do is drill a hole in the workpiece and thread the blade through it. Then mount the blade in the saw to make the cut. And by rotating the blade in the frame, you can angle it to reach into inside corners. Unlike most other hand tools, there are no "high-end," expensive coping saws. For about $15, you can buy a well-made saw that will probably last a lifetime. And high-quality blades will only set you back about $5 for a dozen. You can leam more about the blades in the box at the bottom of the opposite page. A close cousin of the coping saw, the fret saw is the tool of choice for intricate work. At first glance, the deep-throated fret saw shown in the photo on the opposite page looks a lot like a stretched-out coping saw. But closer examination shows an important distinction. The method for attaching the blade is quite different. Fret saw blades do not have pins. Instead, clamps on the saw hold the ends tight. An added benefit of this clamping method is that you can use commonly available scroll saw blades. With the aid of a bird's-mouth table to hold the workpiece, you can cut inlay pieces quickly and accurately. The smaller fret saws are sometimes called jeweler's saws because of their frequent use in cutting precious metals. In addition to the blade clamping mechanism, these saws also feature an adjustable frame. This enables them to accommodate different blade lengths. USING A fRiT SAW. You wouldn't want to use a fret saw for the heavy work of a coping saw. The thinner blades aren't designed for heavy cutting. But it's capable of much greater precision. The saw gets its name from the delicate patterns characteristic of classic fretwork designs. Even if you don't intend to do this kind of work, there are some common woodworking tasks that a fret saw will make easier. While the saws get all the credit, it's really the range of blades for coping and fret saws that makes them such handy tools. Specialized coping saw blades can be purchased to cut plastic, metal, and even ceramic tile. And a fret saw equipped with a metal-cutting blade can come in handy for cutting soft metals. COPING SAW BLADES. 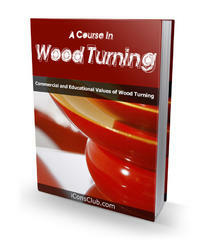 Woodworking blades are commonly available in 10, 15, 20, and 24 teeth per inch (tpi). The 20- and 24-tpi blades leave an extremely smooth finish, while the 10- and 15-tpi blades are great for an aggressive, fast cut. FRET SAW BLADES. Fret saw blades are sold by gauge rather than teeth per inch. The gauge indicates the thickness of the blade. For example, a 2/0 blade is .011" and the 3/0 is .009". These are the most common sizes used by woodworkers. For a more aggressive cut or when working with thicker stock, you can install a scroll saw blade on a fret saw. The wide variety of scroll saw blades means you'll find one suited for almost any task. hang of it, you'll hardly need to do any clean up with a chisel. INLAY WORK. Another application where the fret saw really shines is cutting small, intricate pieces for inlay or marquetry work. Here again, the blade can follow even the tightest curves of your patterns. Since these workpieces are often very thin, a method of support is crucial to making a successful cut. A fretwork cutting table, sometimes called bird's-mouth or V-board, is often used to hold a workpiece. You can see this in action in the photo at left. The V-shaped cutout on the table gives you plenty of room to move the saw while supporting both ends of the workpiece. BREAKING BLADES. On the downside, the thin blades that make the fret saw a great tool for intricate work, also make for frequent blade breakages. 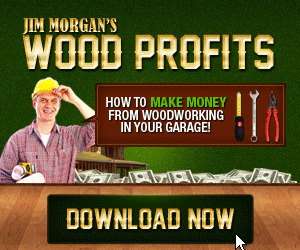 But you'll quickly leam how to get the most life out of each one. Usually, this means avoiding binding it in a cut. mechanisms are an important distinction between coping and fret saws. If you think of coping and scroll saw blades as thin and narrow, fret saw blades give you a new perspective. How to use a coping saw for box joints? How to use tile fret saw? How thin saw do you need for citing frets? How to install blade in fretsaw? Can you make small intricate cuts with a coping saw?